There’s a duck nesting in the worst place! What should I do? A duck family has taken over my pool! How do I get them to leave? There’s a duckling stuck in my pool! How do I get him out? How do I move a duck family out of a contained courtyard? How do I catch and move a duck family if absolutely necessary for their safety? Ducklings fell through a sewer grate! How do I get them out? Each year, people are amazed to see ducks and ducklings in the most unlikely places, such as walking single-file through city streets or nesting under bank teller windows! Luckily, ducklings are precocious and mature quickly. Here are some common sense solutions to typical problems encountered in suburban and urban settings. Q: There’s a duck nesting in the worst place! What should I do? 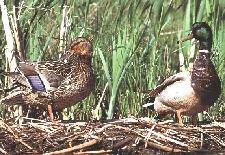 A: Ducks commonly nest in poor spots, such as under bank‑teller windows or the middle of busy ball fields. These nests may fall prey to cats, dogs, or human malice. However, if you move the eggs and nest, the parents usually won't follow it. We suggest putting up educational signs and perhaps trying to fence off the nest temporarily. There isn't much else you can do. Some people have tried moving the nest, a few feet at a time, into a better area. This may work if the relocation site is nearby and you move the nest a bit by bit. However, the mother may stay on the nest which makes relocation impossible. It’s usually best to leave the nest alone and hope for the best. Q: A duck family has taken over my pool! How do I get them to leave? A: The best solution is to leave them alone, as long as the ducklings are able to get out of the pool. The mother will move her young when they are older and less vulnerable. If you must evict them, go to your local party store and buy silver mylar balloons containing cartoon faces on them with big eyes, and attach heavy weights to the string. Put the balloons around the perimeter of the entire pool, about every 20 feet. The balloons will bob in the breeze and make the ducks nervous. To enhance the harassment effect, you can also float a beach ball in the pool or use an electric boat. There’s a product called a "Scare‑ Eye" balloon which has giant reflective eyes (for an enhanced scare effect) and is available at most hardware or garden stores or through mail-order via Bird Barrier, Inc (phone: 800-503-5444 or www.birdbarrier.com). Q: There’s a duckling stuck in my pool! How do I get him out? A: Most ducklings get stuck in pools because the water level is too low. The solution is to either raise the water level (simplest approach), fish them out with a net, or create a ramp angled less than 45 degrees, with a wet towel attached to it for traction. Q: How do I move a duck family out of a contained courtyard? A: You can shepherd them out by creating a "moving wall" (i.e. have people hold sheets between them and move behind the ducks, forcing them to walk in the desired direction). However, consider waiting to move them out because the young may be vulnerable. Sometimes we encourage the temporary feeding of greens like kale, spinach, and also poultry starter food, (available from a animal feed store) and setting up a shallow kiddie pool with ramps, until the ducklings can fly. We encourage provisioning particularly in cities, where early eviction can mean certain death. Q: How do I catch and move a duck family if absolutely necessary for their safety? A: The only way to catch adult ducks is to do so at night (they don’t see well in darkness), by creeping up on them while they sleep, then gently cover them with a lightweight blanket or towel, and scoop them into a carrier. Catch the ducklings next with a net or sheet, but try to minimize stress as they will be scared and may scatter. Be sure the net doesn’t have large holes in which they may escape or become entangled. Consult your state fish and game agency prior to any intervention for any special authorization you might need. Q: Ducklings fell through a sewer grate! How do I get them out? A: These are tricky situations. Often you’ll have to contact your town’s Public Works Department for assistance with removing the grate. The police can be a valuable resource in terms of helping you contact the right town employee. You’ll need a fishing net, carrier or other container to catch the ducklings. You may have to be creative in terms of capture strategies, depending on the logistics of where they’re stuck. Once you catch them, make sure they are dry (or use a hair dryer set on low) before setting them back outside for the mother to retrieve. Put an upside down laundry basket over them until the mother comes (so they don’t scatter), and then slowly lift it when she reappears. If she doesn’t come back by nightfall, contact your local wildlife rehabilitator for assistance.